Based on our survey of a wide range of secondary sources, it appears that commodity and product shortages have already hit Japan and will soon spread into Asia and potentially the rest of the world. For many commodities, suppliers will bring production back online quickly enough to avert longer-term shortages and/or price spikes (and we may even continue to say downward price pressure on certain commodities until larger parts of the Japanese manufacturing economy come back fully online). Yet this tragedy no doubt brings with it the potential for some of the largest, cross-industry supply disruptions in recent memory, and nearer-term price increases in key commodities in the high-tech market are almost a foregone conclusion. 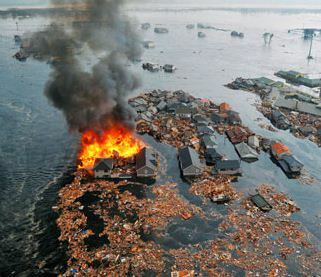 For the regions of Japan that were directly in the crosshairs of Mother Nature and/or the resulting nuclear power disruptions and potential radiation risk, the specter of lasting disruptions and longer-term economic impact are certain to remain long after the wreckage is cleaned up. Reuters is reporting power outages in “some areas covered by Tokyo Electric Power Co and Tohoku Electric Power Co, to avoid complete blackouts” and “Tokyo Gas Co said it had stopped supplying gas to more than 35,000 households and facilities.” From a supplier perspective, Reuters suggested late on Sunday that two Canon plants supplying photo optics (lenses) and LCD screens remain shuttered (these facilities were “slightly damaged” in the quake. All of Honda’s facilities remain closed. Panasonic’s facilities appear to potentially be in the worst shape of all — aftershocks prevented team members from even “inspecting two factories in northern Japan, one making optical pick-ups and other electronic parts and another making digital cameras and audio equipment.” A lack of running water and power continue to plague these facilities and others. Scores of other facilities, including what we’ve heard are at least dozens of mid-tier supplier plants, remain offline and are likely to remain so into this week. High-tech manufacturers should also prepare for disruptions as the result of disruptions at various producers of raw materials for semiconductor production. One source, linked above, reports that production was suspended at “Shin-Etsu Handotai Co.” and that “Powerchip Semiconductor Corp., a major local computer memory chipmaker … believed the supply of silicon wafers would be affected.” United Microelectronics Japanese subsidiary “was partially affected by the earthquake but was returning to normal as power was gradually restored.” Even if supply remains constant and available, the industry is already “expecting a price hike as major manufacturing zones and electronics plants” attempt to bring full capacity back online. Spend Matters research suggests that even though much of the potential supply disruption spotlight will turn to companies like Apple, Samsung, Dell, Nokia and others involved in consumer devices/tablets, smart phones, PCs and related systems, that all manufactures that leverage integrated circuits, chips, screens/monitors (e.g., LCD), etc. are potentially at risk. In fact, it’s a plausible scenario that because leaders like Apple maintain such a dominant role within their supply chain, that other companies are more likely to be impacted by upcoming supply shortages as the impact of the disaster makes its way through the supply chain. Stay tuned to Spend Matters for continuing coverage of the Japanese earthquake and tsunami throughout the week. Our sister site, MetalMiner, will be covering the nuclear side of the unfolding disaster as well (and has already provided a summary of metals production and supply-related disruptions in the region, including steel and copper production. For general supplier relationship management and logistics recommendations for the crises, we recommend reading our previous analysis on the subject from Friday. For a consumer, choosing a product is a matter of comparing the facts, price and some more great features as well. This is now getting more importance, because there is much competition in the market for each and every product. The consumer judges the case and decides who is telling the truth, which has the most evidence that is relevant to their needs, and ultimately who is the best product to use or best business service.